● A Brand new creative birthday gift or home décor night light for anyone of any age. ● Easy operation 7 Color Change mode: Both Smart Remote control function and Smart Touch function. ● 2 operation modes for your option You can choose to stay in a single color mode as from red-green-blue-yellow-cyan-purple-white; Also you can enter into auto 7 colors change cycle mode. Suggest use USB cable powered for daily using. Suggest use 3 x AA battery powered for urgent using.Box not includes 3 x AA battery,you can buy it in your local store for using. ● Before inserting the acrylic panel into the Base,Please do remember to remove the protection film from the transparent acrylic panel surface when first time using. ● Please use a soft cloth to clean the acrylic panel surface if there is a mark on the surface. ● Do not touch the acrylic panel surface with your fingers to avoid finger print marks onto the panel surface which may affect the 3D effect. ● Material:Safe ABS+Acrylic,Lower Energy and Portable Beside lamp for Kids,Kids desk lamp,Kids Cute toys.Chirldren's Perfect All-night Companion Help Kids Feel safe at Night. ● Gift Ideal for All:Fun Creative gifts for baby,kids, boys,girls and Animal Dinosaur Lover,Birthday gift,Thanksgiving gift,Christmas Gift,New baby gift,Baby Shower gift,Holiday gift,Kids gift. 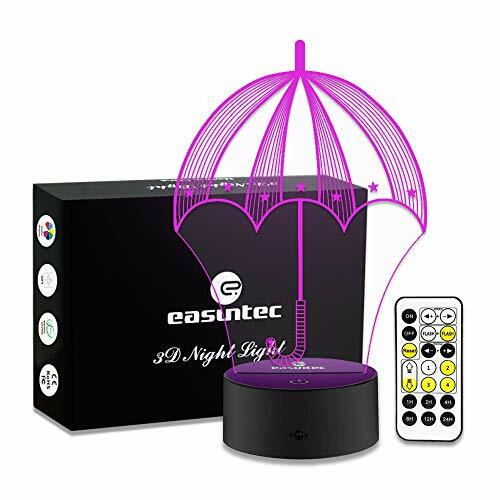 ● Easy Dual change light Mode:Smart Touch + Remoter Control with Timer + Dimmer, Adjustable 7 colors red green blue yellow cyan purple and white,Or 7 colors cycle Automatcially mode. ● Mini Size:5.5''(W)*8.7''(H) ,Main Power Supply Mode: via USB cable + Wall Plug(not included),via Power Bank,Or via 3 x AA battery(not included),via Laptop computer and so on. ● We promise Lifetime Warranty: All Easuntec branding 3d lamp achieved CE RoHS and FCC Certification Standard,More Easuntec Branding New updated lamp will be released soon. View More In Lamps & Lighting. If you have any questions about this product by easuntec, contact us by completing and submitting the form below. If you are looking for a specif part number, please include it with your message.